Awww... sometimes I wish Timon had been a parent. I don't think this kit likes his babysitter. Does this kat look guilty to you? I love the way they sit! They just sit. I'm running out of captions... Tealin, can you think of one? 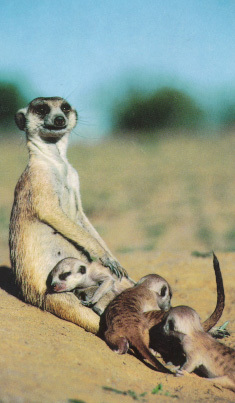 I love meerkat families, don't you? Now, Timon looks a bit different from his three-dimensional cousins. But he certainly has the personality. Meerkats are known for their quick wits, togetherness factor, and caring nature. Unfortunately, you can't keep them as pets without many difficulties. First, you have to kat-proof your house. They will chew, dig up, and destroy most of your home. Then, after you've created a double-escape proof house, you need to apply for a special permit. In the United States, kats are considered "detrimental". Then, you'd have to pay for shipping the meerkats (since they are very, very, very social, you would have to acquire several) from Africa to America. The entire time, they would need escape-proof cages and other accessories. Meerkats are also expensive to feed. They won't eat people food, and nobody has made meerkat chow. You would need to ship in several pounds of live insects a day, let them loose in the kat cages, and without fail, many bugs would escape into your home. They also frequently bite. Sometimes, kats can have rabies, and that's a problem. The bottom line is this: Meerkats are incredibly adorable, but not good pets. Go to your zoo, and christen a kat as "yours". If your zoo doesn't have meerkats, adopt one! There's a link at the bottom of the page. Go visit the other characters! Or come back to the Shrine! You may also adopt a meerkat!